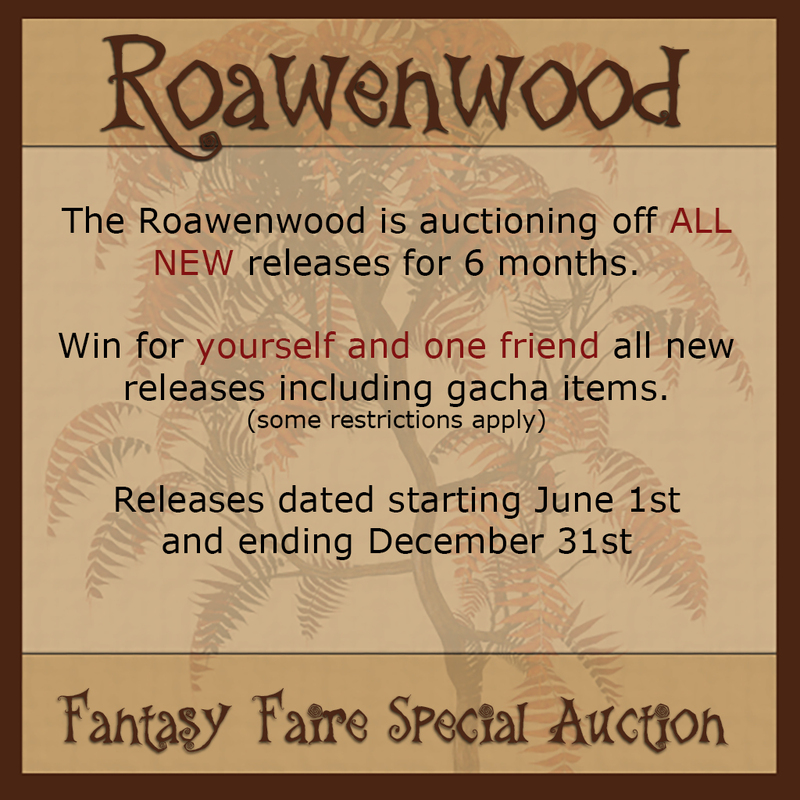 Would you like to win for yourself and one other person (or an alt) a full 6 months worth of new releases from the Roawenwood? Well……….. guess what? As part of Fantasy Faire I decided to go big. This year like I keep going on and on about is my tenth year in SL, along with the Roawenwood also finding itself in the same predicament, so THIS year I’m going a little bit big in all things when I can. This auction will if won give the winning bidder plus one friend/alt of their choosing new releases from the Roawenwood for a period of six (6) months beginning on the first of June and concluding December 31st 2016. Products defined as new may be store releases, event releases, marketplace releases, or gacha sets. Gacha sets made available as part of the ‘new releases’ for the month if applicable will ONLY be given as no transfer objects to the winning bidder and friend. The winning bidder is defined as the Second Life avatar account that wins the silent auction during Fantasy Faire 2016. The friend or alt is defined as the Second Life avatar account that is named by the winning bidder at the conclusion of the silent auction for Fantasy Faire 2016. 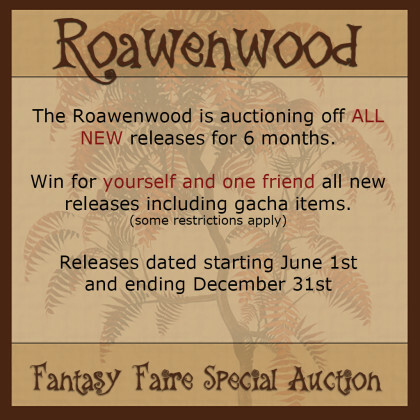 Only the winning bidder and the friend/alt Second Life accounts named at the conclusion of the silent auction for Fantasy Faire 2016 will be eligible to receive the monthly new releases packages promised by the store entity known as the Roawenwood. The auction and prizes cannot be transferred to another Second Life account under any circumstances. The prize package cannot and will not be redeemed for Lindens, or monetary compensation of any sort. The new releases can cover a broad spectrum of content though generally of the Home and Garden category there can be accessories for avatars, some clothing – generally female, and other miscellaneous items as the creative spark hits. There are no guarantees or promises on content that may or may not be delivered other than what is outlined here and the winning avatar should be aware of the possibility of adult content being a part of the items created for the Roawenwood. ALL proceeds for this auction benefit RFL (Relay for Life) and the avatar/person known as Searlait Nitschke will receive no monetary compensation of any kind in conjunction with the aforementioned auction. The notecard in world has some recent releases type pictures and all that you can get at the auction site but if you’re looking at the blog you can see things in older posts. In general, whatever I come up with is fair game. Have fun and bid!!! It’s for a good cause! Silent Auction @ The Faire! ← Roawenwood & Fantasy Faire 2016!